In late July I traveled to Cuba to teach at a seminary located in Havana. It was not my first visit to a Communist country. I have been to Russia and many of the countries of Eastern Europe when they were controlled by Communists. I have seen firsthand how Communism can literally destroy an economy, enslave the people, and rob them of all hope. But Cuba still shocked me. The place is frozen in time. To go there is like getting into a time machine and traveling back to the 1950s. Fidel Castro's revolution succeeded in 1959, 54 years ago, and all progress was stopped dead in its tracks at that time. Castro confiscated everything — homes, cars, businesses, plantations and bank accounts. Then everything was "re-distributed" to the masses. The result was the destruction of the middle class. Today, a small Communist elite rules with an iron hand over a population that is wallowing in abject poverty. In classic Communist fashion, every city and town has neighborhood watch committees that are called "Committees to Defend the Revolution." These committees keep watch on everything that is going on in their assigned area, and they make reports to the government concerning anything they consider to be suspicious, for which they are given rewards. The average income is $30 per person per month. No one owns anything. Houses and cars are just passed down from generation to generation, and they can be taken away at a moment's notice if someone in the family steps out of line. Very few new vehicles have been imported into the country since 1959. The curious result is that everywhere you look you see Chevrolet Bel Airs and Ford Fairlanes from the 1950s. 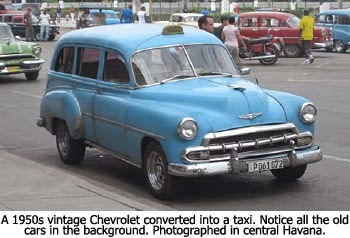 I concluded that Cuba must be the "heaven" where 1950 Chevrolets and Fords go when they die! It's amazing to think that these cars are still chugging along after 50 years. Every one that I got into was stripped inside of its door and roof panels. They were just metal shells with a motor that sounded like a McCormick Reaper. The staple food is rice with black beans, which may be served at every meal. They do have access to a variety of tropical fruits, many of which they grow in their yards. For special occasions, they may have chicken. The people have no access to the Internet. I suppose the idea behind this is to keep them ignorant about how the rest of the world lives. My only surprising discovery was the degree of religious freedom the people of Cuba are granted. House churches are allowed and seminaries are tolerated, unlike in China where Christians are persecuted, churches are severely limited in number and seminaries are closely guarded, allowing only a handful of graduates each year. Still, no religious group in Cuba can broadcast on radio or television or run an advertisement in a newspaper. Speaking of the media, I was told that there are only four TV networks in Cuba, and when I asked what they were, I was told, "Castro, Castro, Castro, and more Castro!" One of the Cuban Christian leaders told me that the government leaves the churches alone unless there is a report that the pastor has spoken out against some government policy. I had a group of 42 students in my seminary class on the fundamentals of Bible prophecy. Nearly all were pastors. There were a few elders and a few women. They were very cordial, and I enjoyed sharing God's Word with them and answering their many questions. I taught for four full days in a room that could comfortably hold only about 30 people. So, we were crammed into a small space with no air conditioning during days when the temperature reached 100 degrees and the humidity felt like it was 95 percent. It was the hardest mission work I have ever done. 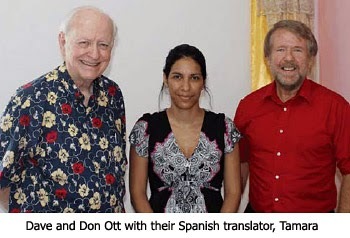 My wonderful host was a great man of God named Don Ott. Don is a clinical psychologist who lives in Arkansas. In his "spare time" he pastors a church, teaches at a Bible college, and makes mission trips all over the world. He was a perfect host. I arrived back home totally exhausted and ill. I have since been praying that I was able to accomplish what God had in mind for this outreach.